Tanaka Ikuko was born in 1937 and lives in Okayama prefecture in western Japan. She is a member of the Japan Poets Association, a member of a poetry journal Stem (すてむ) and the editor of a private poetry journal, Ryoku (緑). The Song of Rowanberry, her sixth collection of poems, was awarded the Ono Jyuzaburo prize and the Chu-shikoku regional poetry prize. Her poetry collections: The Mulberry Memory (1991 Shigakusha), Summer in Chiya (1994 Kashinsha), The Late Autumn Table (1996 Shichosha),The Festival of Blue Purple (1999 Ryokushisha),Windows and Husk Tomatoes (2002 Ryokushisha), The Snow Story (2011 Shichosha). 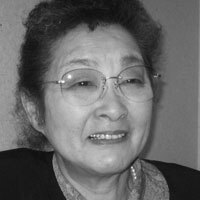 Miho Kinnas is a Japanese poet/translator. Her poems have appeared in journals including Cha: An Asian Literary Journal, 24 Pearl Magazine and Really Systems. She holds an MFA (Creative writing Poetry) from City University of Hong Kong. Her collection of poems Today, Fish Only is due to be published from Math Paper Press in 2015. She currently lives in Hilton Head Island, South Carolina, USA with her husband, Ben. Shelly Bryant divides her year between Shanghai and Singapore, working as a teacher, writer, researcher, and translator. She is the author of five volumes of poetry, Cyborg Chimera, Under the Ash, Voices of the Elders, Harps Upon Willows, and The Lined Palm, and two travel guides, one to the city of Suzhou entitled Suzhou Basics, and another co-authored with Nick Land and Lily Sun, entitled Open Door Guide to Shanghai. She also translated Sheng Keyi’s novels Northern Girls and Fields of White for Penguin Books, and Death Fugue for Giramondo Press, Chew Kok Chang’s short story collection Other Cities, Other Lives for Epigram Books in Singapore, and Li Na’s memoir, My Life, for Penguin Books. She also edited a collection of speculative poetry, A Demon in My View. Her poetry has appeared in journals, magazines, and websites around the world, as well as in several art exhibitions, including dark ’til dawn, Things Disappear, and Studio White • Exhibition 2011.